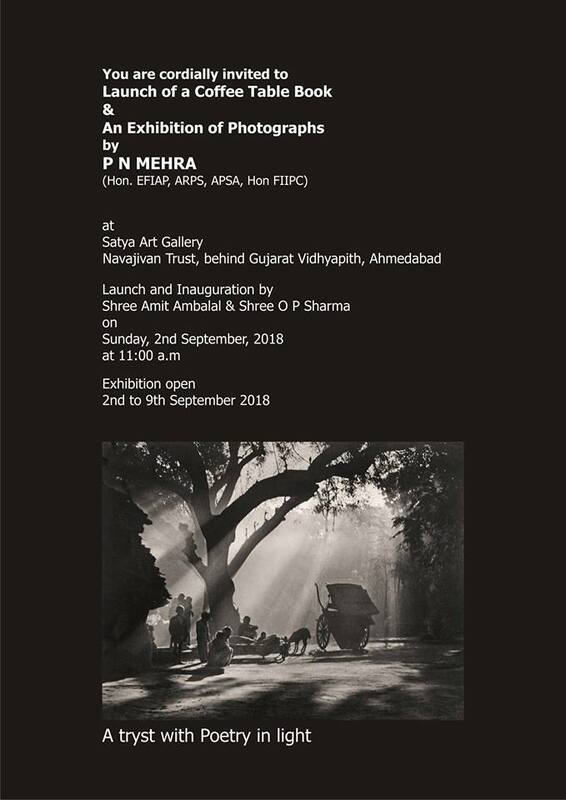 Commemorating Mr. P N Mehra’s Birth Centenary this year with an exhibition in his final resting place Ahmedabad at the Satya Art Gallery, Navajivan Trust. The occasion also includes the launch of a Coffee Table Book with a selection of 100 photographs from his long-spanning career of over 60 years. The exhibition consists of original darkroom prints made by Mr. P N Mehra himself. Born in Peshawar on 03 September 1918 and inspired by the photographs reproduced in the ‘snapshot’ pages of the Illustrated Weekly Of India; Pran Nath Mehra acquired a humble Box Camera to satisfy his pictorial creative urge at the age of fourteen. His interest in watercolors coupled with a good eye for what is pictorial gave him a sound foundation in composition. All this and a lot of hard work soon rewarded him with success at all the India salons. His main forte was “light” and its varied manifestations. By the fifties, he was a prolific exhibitor in national and international salons and also contributed a series if articles and photographs to photographic magazines all over. He was the president of the Federation of Indian Photography for two terms from 1068-1972. The man had two prominent characteristic streaks. Firstly, ‘his wanderlust’ which combined with his love for the mountains meant long treks in the Himalayas. Secondly, his instinctive eye for the aesthetic, which resulted in his vision to seek the picturesque in the nooks and the nullahs; the huts and the hamlets, the receding planes of the mountain ranges and the dynamic diagonals of the slopes. He carried his camera along to record his reaction to the magic of light till his death on 02 July 1998.